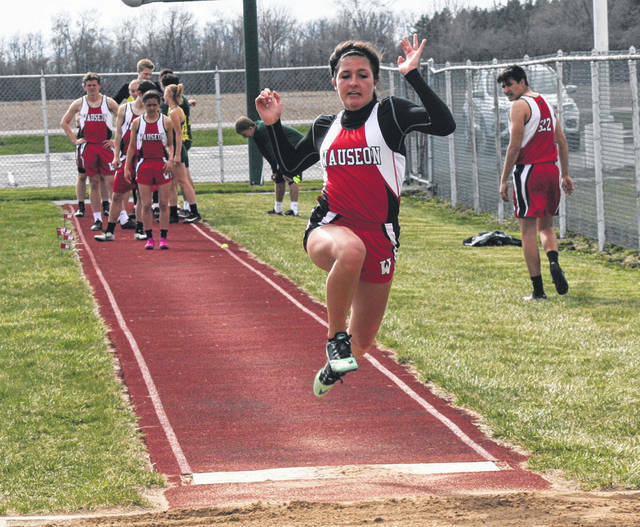 Wauseon’s Paige Allison Smith in the long jump Tuesday at Evergreen during a NWOAL tri-meet with the Vikings and Archbold. She was first with a leap of 15 feet, 5 and 3/4 inches. 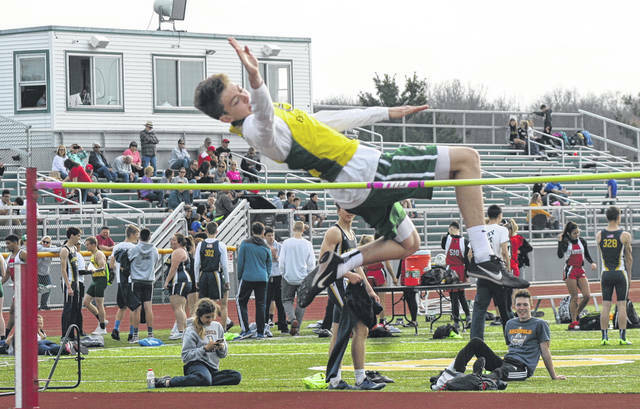 Mason Loeffler of Evergreen took home the title in the boys high jump during Tuesday’s NWOAL tri-meet. He was first after clearing 6 feet, 2 inches. Hannah Richer of Wauseon runs as part of the Indians’ 4x800 meter relay team that took second to Archbold. 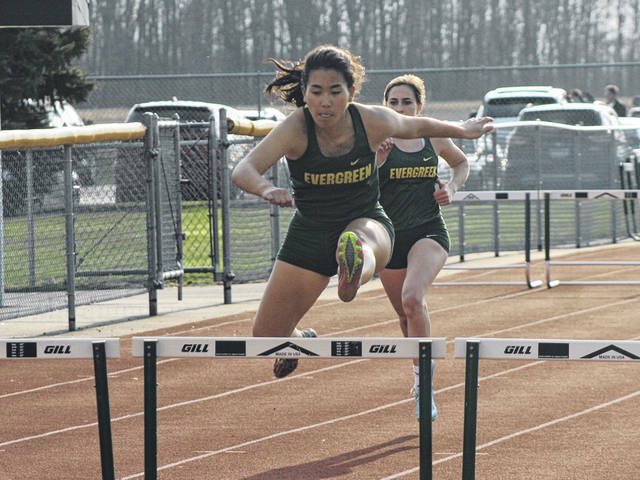 Asia Gensch of Evergreen clears a hurdle in the 300m hurdles. She took home titles in the 100m hurdles and 300m hurdles. 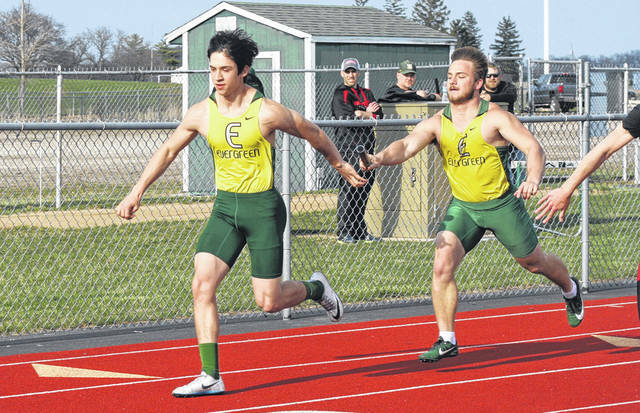 Evergreen’s Hunter Vanwert, right, makes the handoff to Reece Serna in the boys 4x200 meter relay. The Viking quartet of Shane Ruetz, Anthony Sanders, Vanwert and Serna finished runner-up with a time of 1:38.46. Xavier Torres of Wauseon competes in the long jump. He placed first in the event, helping the Indians take first over Archbold and Evergreen in the team standings. 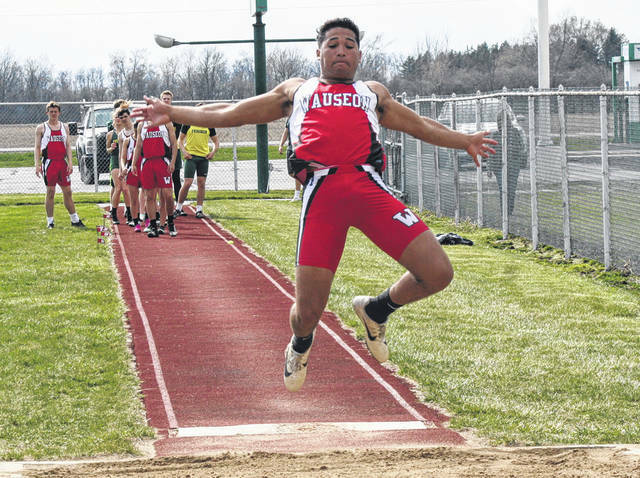 Wauseon swept a Northwest Ohio Athletic League track and field tri-meet held Tuesday at Evergreen. Archbold was second, and host Evergreen third in both the boys and girls meets. In the boys meet, Wauseon’s James Hutchinson took first in both hurdle events. Other individual winners for the Indians were: Samuel Blanco, 200m; Layton Willson, 800m; Braden Vernot, 1600m; Michael Cheezan, 3200m; Gregory Moore, pole vault; and Xavier Torres, long jump. Archbold’s Matthew Gladieux claimed titles in the shot put and discus. Also taking first for the Blue Streaks were Trey Theobald in the 100m and Austin Roth in the 400m. Mason Loeffler of Evergreen took home an individual title in the high jump. 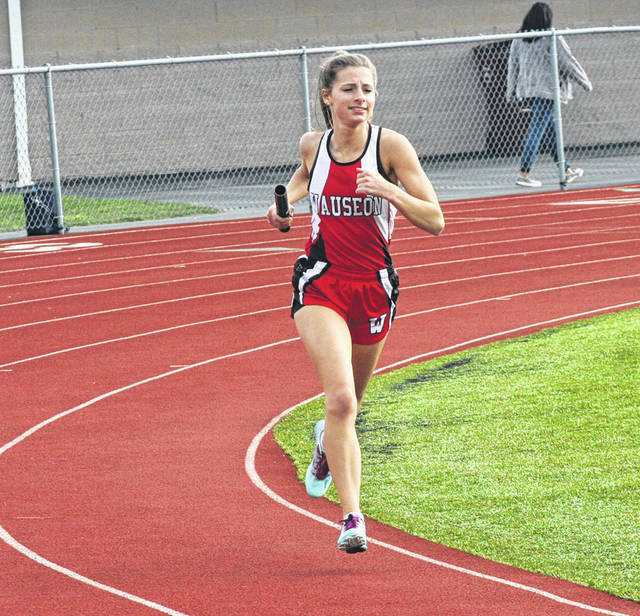 The Wauseon girls swept the distance events as Sam Aeschliman won the 800m, Maggie Duden the 1600m, and Serena Mathews the 3200m. In the field, Paige Alexandria Smith won the pole vault for the Indians, Paige Allison Smith the long jump, and Sydney Zirkle the shot put. For Archbold, Dakota Stamm took first in the 100m and 200m. They also got wins from Gwynne Riley in the 400m and Kiera Gensler in the discus. Asia Gensch of Evergreen swept the hurdle events. Kyiah Harris won the high jump for the Vikings. 100- Theobald (A), 11.3; 200- Blanco (W), 26.31; 400- Roth (A), 56.33; 800- Willson (W), 2:15.62; 1600- Vernot (W), 5:00.33; 3200- Cheezan (W), 10:45.42; 110 hurdles- Hutchinson (W), 16.43; 300 hurdles- Hutchinson (W), 43.2; 4×100- Evergreen (Sanders, Etue, Serna, Vanwert), 47.25; 4×200- Archbold (Tijerina, Gomez, Theobald, Grime), 1:36.4; 4×400- Archbold (Grime, Roth, CullenLemley, Theobald), 3:41.74; 4×800- Wauseon (Vernot, Nofziger, Cheezan, Wasnich), 9:52.14; High jump- Loeffler (E), 6-2; Vault- Moore (W), 11-8; Long jump- Torres (W), 19-2.25; Shot put- Gladieux (A), 46-6; Discus- Gladieux (A), 149-1. 100- Dakota Stamm (A), 12.79; 200- Dakota Stamm (A), 26.31; 400- Riley (A), 1:03.06; 800- Aeschliman (W), 2:33.69; 1600- Duden (W), 5:51.54; 3200- Mathews (W), 13:09.06; 100 hurdles- Gensch (E), 16.81; 300 hurdles- Gensch (E), 50.35; 4×100- Wauseon (Rupp, Perez, Demoulin, Parker), 55.91; 4×200- Archbold (Richardson, Pena, Riley, Dakota Stamm), 1:52.32; 4×400- Archbold (Brittney Ramirez, Pena, Riley, Dakota Stamm), 4:16.31; 4×800- Archbold (Karley Ramirez, Hudson, Regan Ramirez, Montana Stamm), 11:30.83; High jump- Harris (E), 4-8; Vault- Paige Alexandria Smith (W), 8-0; Long jump- Paige Allison Smith (W), 15-5.75; Shot- Zirkle (W), 34-2.5; Discus- Gensler (A), 103-5. Hannah Richer of Wauseon runs as part of the Indians’ 4×800 meter relay team that took second to Archbold. Evergreen’s Hunter Vanwert, right, makes the handoff to Reece Serna in the boys 4×200 meter relay. The Viking quartet of Shane Ruetz, Anthony Sanders, Vanwert and Serna finished runner-up with a time of 1:38.46.